It slices, it dices, it can cut a rusty nail and then a tomato. You've heard that one before, but what's the real story? First off, let's get this one out of the way: you can't get fourteen great knives for thirty-five bucks. Sure, they might be sharp out of the box, but how will they last? Ginsu knives have such a great marketing history and there are plenty people out there that are impressed by their initial sharpness. So it's easy to get caught up in the hype and think that these are an amazing deal. But the truth is that these are cheap knives. The blades are made of 420 steel, typically used only in low-quality knives. 420 is a step below 440A steel, a material we typically do not recommend. Of course, a high-quality heat-treatment can make up for inferior materials. But that costs money and you'd see it reflected in the price. And it's unlikely that anyone who is going to do a decent heat treatment is going to waste it on 420. One other thing about this knife set... it includes knives you don't need. 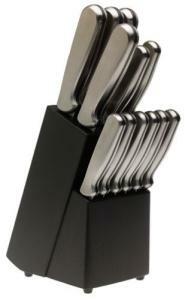 You're better off getting a smaller set of high-quality knives than this large set of inferior knives. If you're looking for budget knives, we highly recommend the Forschner 3 piece set. That's a set of three essential knives that are an amazing value. You'll be very pleased with these, and they will last a long time. You can always add to that set over time if you must have a larger set. Of, f you want a larger set to start out, save up and get the Forschner 8 piece set. But don't waste your money on the Ginsus.